One of the perks of living in Seattle is that we have so many gorgeous weekend trip options. 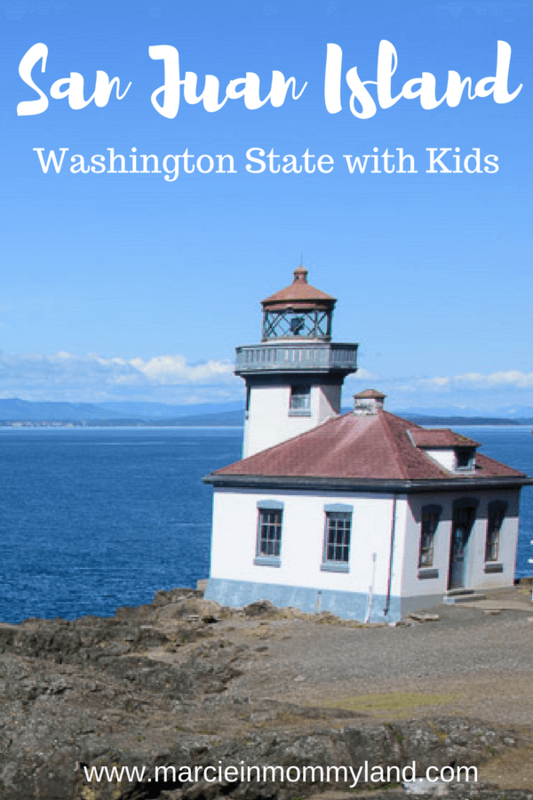 As a family with a baby and a preschooler, we love taking small trips around Washington State. 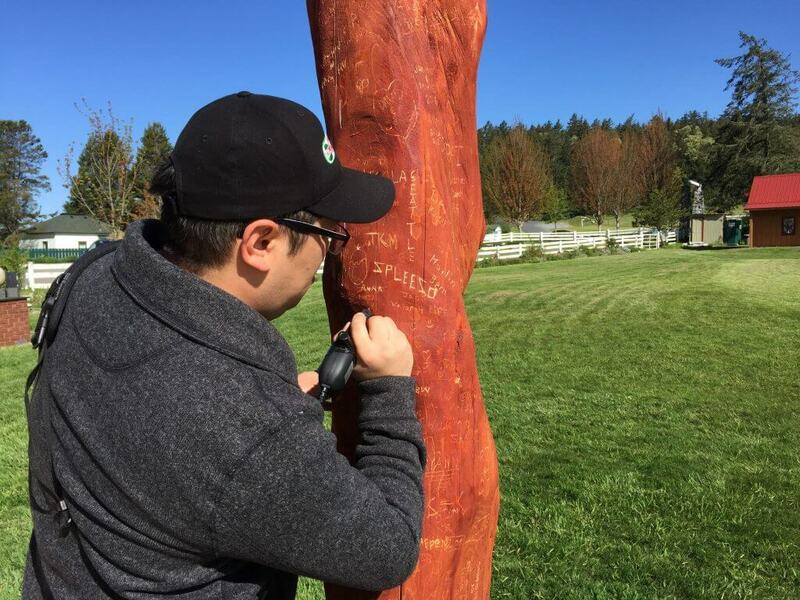 We’ve recently visited Semiahmoo Resort & Spa, Suncadia and Seabrook. 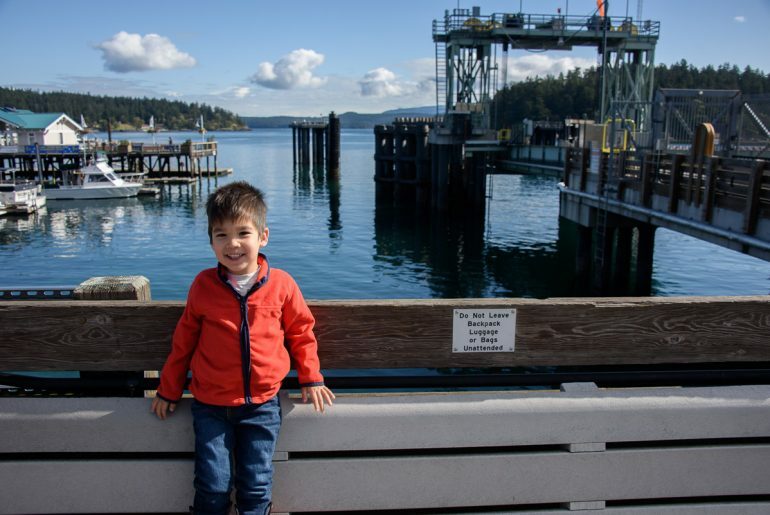 A few weeks ago, we had the opportunity to head up to Friday Harbor on San Juan Island. Spring has finally arrived in the Pacific Northwest and San Juan Island was simply stunning. We were impressed with all the fun things to do in San Juan Island with kids! We started our trip by driving up to Anacortes, WA on Friday afternoon. Thank goodness for the carpool lanes because we had a 6pm ferry to catch. The ferry ride was about 75 minutes. We managed to grab one of the last tables on the upper deck. I headed to the cafeteria and got a cup of Ivar’s famous clam chowder and a bag of popcorn. Our 3 year old ate dinner in the car, so he chomped on the popcorn while I enjoyed the chowder. Then, we still had lots of time to head outside and watch the ferry dock at Lopez Island before continuing on to Friday Harbor on San Juan Island. When we got off the ferry, we drove up 4 blocks and arrived at our hotel. 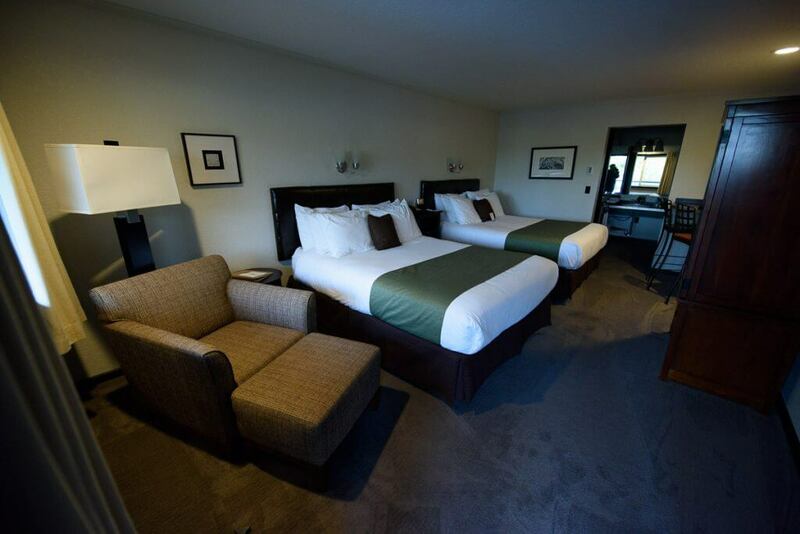 The Earthbox Inn & Spa was recently renovated. It’s the only San Juan Islands hotel with an indoor pool and a classic retro chic vibe. All of their rooms have simple designs and calming colors, inspired by the earth, sea, sun and sky so you can kick back and remember you’re on vacation. And as a bonus, they offer hot coffee, tea and apple cider in their lobby. Since we had our 3 year old and our 6 month old with us, we split them between the beds. I try not to travel with a crib or pack and play if I can help it. They take up so much room. This was an ideal set-up for our family. I also loved the bar seating in this San Juan Island hotel in Friday Harbor. We ended up getting take-out for dinner one night and it was great to have this spot to eat. There were plenty of room for the three of us. There was a great counter top outside the bathroom. That’s where the fridge and microwave were. These were great amenities to heat up leftovers for our hungry kids. I really enjoyed staying at the Earthbox Inn & Spa. The pool was fabulous! I loved that there was a life jacket available for kids. My son put it on and hopped right in the water. It was the first time one of us didn’t need to hold him. It was glorious! We brought our 6 month old in his car seat and he took a nap. I spent my time in the hot tub chatting with other guests. Everyone I spoke to seemed impressed with this San Juan Island accommodation. I loved that the Earthbox Inn & Spa was on the edge of the Waterfront district of Friday Harbor in San Juan Island. It made it easy to just walk from the hotel. We packed the boys in our Uppababy Vista and headed to find breakfast at a San Juan Island restaurant. We parked are stroller at the door and snagged the last table at Rocky Bay Cafe. The interior was super colorful and they featured flags on the ceiling. I had a chai tea and the oatmeal and both hit the spot. They had a great kids menu that featured yogurt and fruit. My son gobbled it up. Our food was really tasty and filling. It’s no wonder they were featured on Food Network. After breakfast, we still had about 2 hours until our San Juan Island whale watching tour. We saw that the San Juan Island Farmers Market was going on, so we headed that way. It was a small market, but they had lots of freshly prepared food and interesting art pieces. Plus there was an on-site massage therapist! We really wanted to get food but we were so stuffed from breakfast. Then, we saw a children’s store and thought we’d check it out. Osito’s offers adorable clothing and an assortment of toys. I found a Koosh ball in Seahawks green and blue! My son also found a few wind up tugboats that he “really, really, really” wanted. I loved that they had a whole display of Green Toys. They are some of our favorite toys! We still had 45 minutes left. I saw a sign for A Place to Play and decided to check it out. 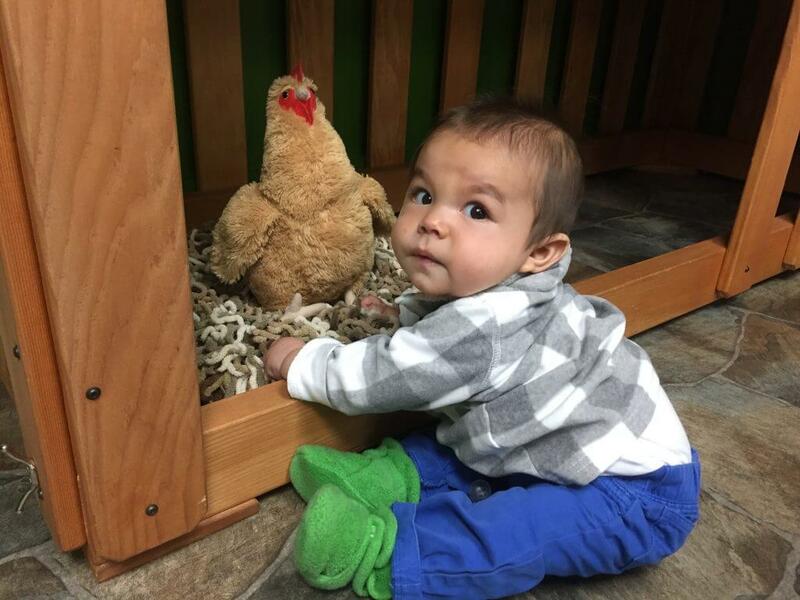 It’s the only indoor play space on San Juan Island. 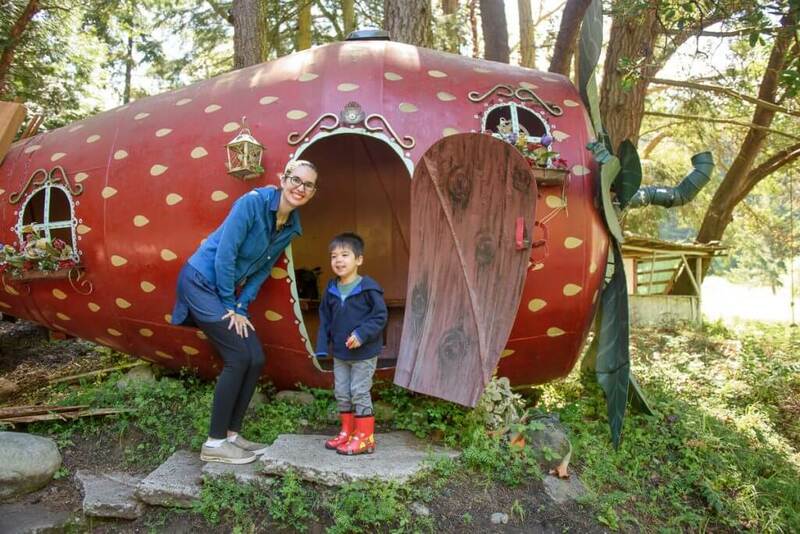 We spoke with the owner and she said when she moved back to San Juan Island to raise her family, she saw a need for an indoor play space. She did a fabulous job creating A Place to Play. Our 3 year old had a blast and didn’t want to leave. It’s a larger space than I thought and it’s set up for imaginative play. There’s a wooden boat, a vintage diner, a camping area, a chicken coop and more. Our son primarily spent his time at the train table. 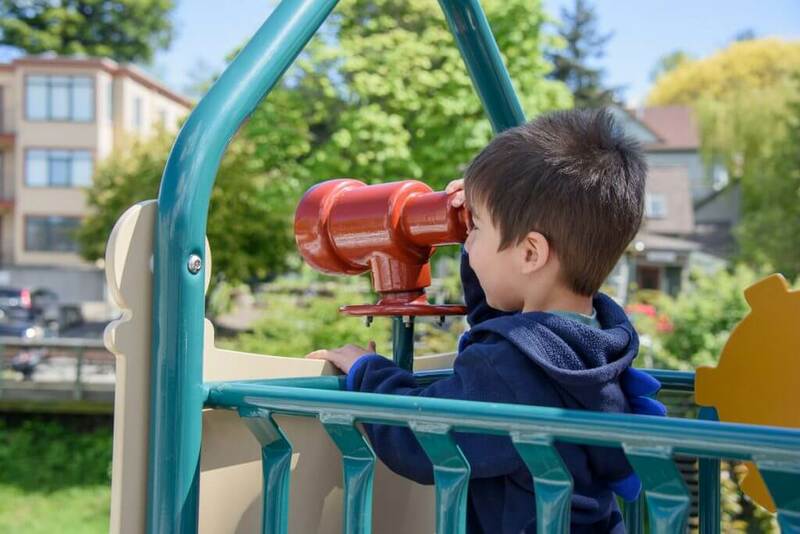 They also have drop-off available for preschoolers, in case parents want to have a quiet lunch or check out the Farmer’s Market at a leisurely pace. We took advantage of their clean bathroom. Not only did they have a changing table, but they also offered a seat reducer on the toilet. This was a perfect pit stop for us because I was able to nurse and change our baby before our whale watching trip. 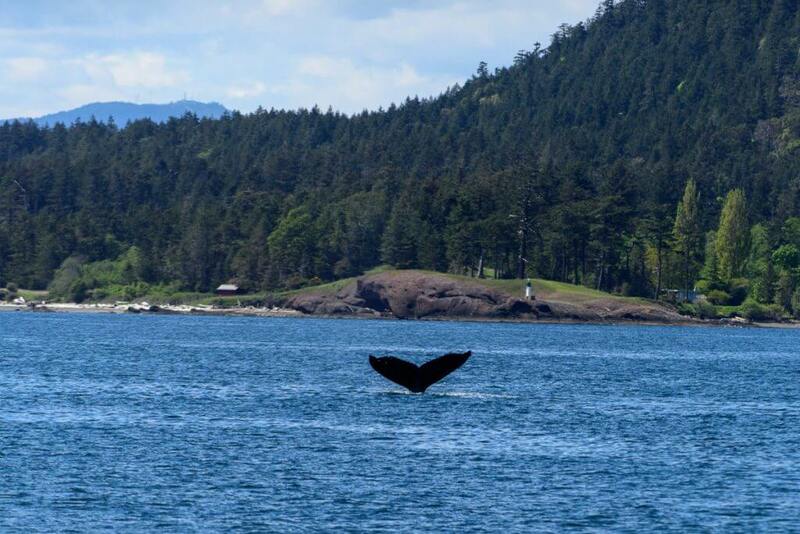 San Juan Excursions is a fabulous San Juan Island whale watching cruise option for families with small children. They had two sizes of child life vests. The naturalists instructed to keep my baby in our carrier or in a life vest whenever we went outside on the deck. I kept him in our Tula the whole time and was glad he could nap comfortably. Even though I had on a jacket, I was appreciative of the indoor option since it was a chilly day. The cabin is heated and they sold snacks for just $1 each. They also had thick blankets for us to use. The naturalists passed out kid-sized binoculars. For kids, they also offered whale-themed children’s books and fun toys on board. There were two naturalists on board who walked around explaining what we’d do on the boat trip. They had laminated handouts that featured pictures of the different whales. We headed up North into Canadian water. There were reports of humpback whales. We ended up seeing several humpback whales and it was thrilling! Our 3 year old was able to spot them. They were diving down into the water to get the fish in a frenzy. Then, they would slowly gobble them up and dive back down. I got some video so we could watch them while we waited for them to make another appearance. We also got to see some sea lions, minke whales, and a bald eagle. I enjoyed just looking at the peaceful water and the little islands we passed. I’m so fortunate to live in the Pacific Northwest. It’s one of the most beautiful places in the world. The captain invited children to come up and drive the boat. Our preschooler was beyond excited! He chatted a bit with Captain Pete and took great pleasure in steering the boat. Captain Pete said he was a natural and must have steered other boats. I guess his practice on his uncle’s boat paid off! They even invited our 6 month old to steer. He gripped the wheel tightly and smiled! It was a great way to end the boat ride! At the end of the boat tour, they offered everyone on board a rain check for another boat tour because we didn’t see orca whales. The rain check never expires so we will definitely be using it on our next trip! My husband and I came to San Juan Islands almost 8 years ago. It was our first trip together and it was with 20 of his relatives for a full week. I was completely overwhelmed and it was a crazy trip. However, we were able to steal away to explore the San Juan Islands Sculpture Park. This was one of my favorite memories and I was excited to come back with our kids. Our 3 year old immediately started exploring the park. He had a lot of questions about the different sculptures. He also wanted to play. We found a rocking horse with a plaque that encouraged kids to hop on. 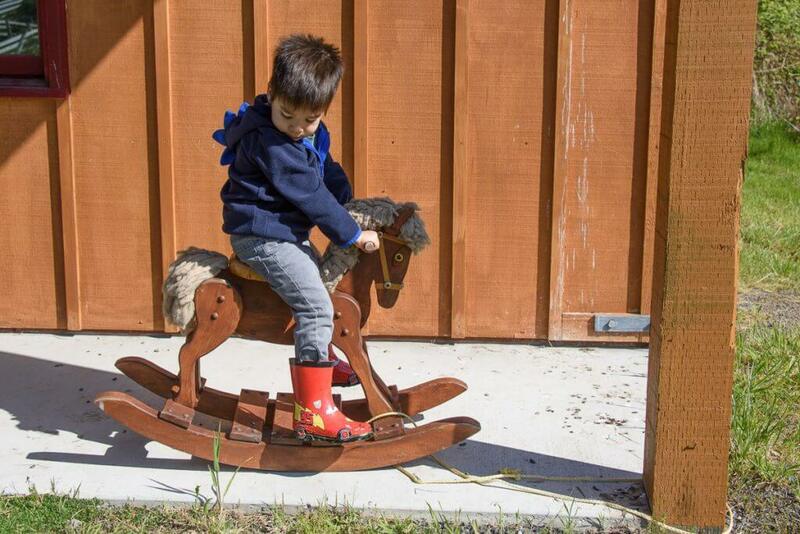 Our son enjoyed the vintage rocking horse for a bit before spotting other sculptures. It’s such a fun thing to do in San Juan Island with kids! Thankfully, my son wore his boots so we were able to explore almost every inch of the park. He wanted to get closer to the water. We compromised by walking near the water so he could toss a few rocks. It was great to get fresh air and spend some time in one place. There was an exhibit where visitors could carve something into wood. My husband carved our initials and the Chinese character for our last name. This was a unique activity to do. It was fun to leave our mark. We ended up spending about 90 minutes walking around the San Juan Islands Sculpture Park. Our next stop on our little trip around San Juan Island was to Lime Kiln Point State Park. Our son really wanted to see a lighthouse. As it happens, I had just purchased our Discovery Pass the week prior so we could park for free. The parking lot is a short walk from the trail that leads to the lighthouse. 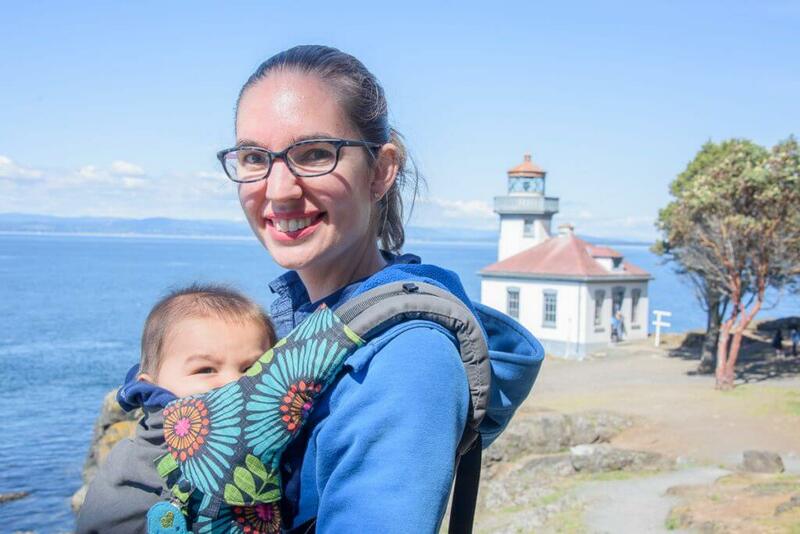 I put our baby in our trusted Tula baby carrier and we started our walk to the lighthouse. Unfortunately, it was closed when we were there. Thankfully, that didn’t phase our oldest son. 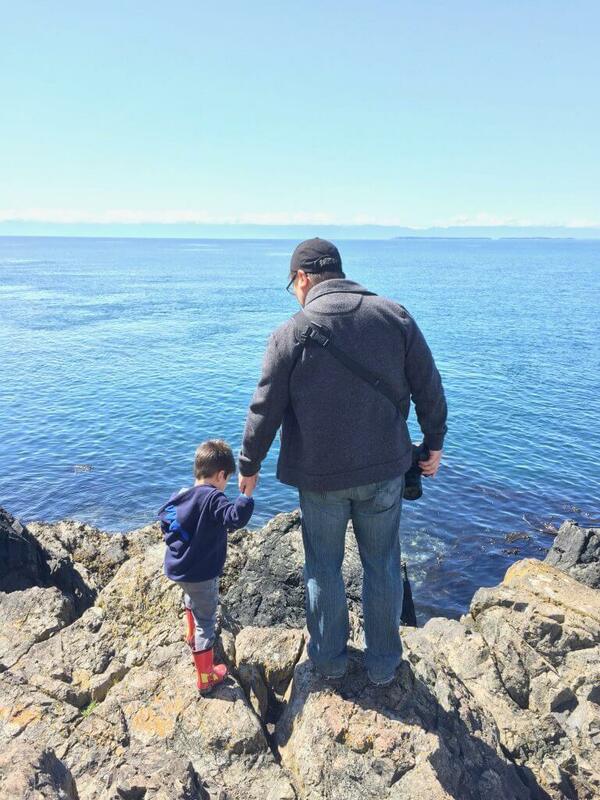 He found handfuls of rocks and was content tossing them into the Salish Sea. We were really careful to hang onto him because it was a long way down to the water. There are lots of gravel paths around there that can get slippery. One of my favorite stops on our drive around San Juan Island, WA was on West Side Rd. We met two women who were hanging out and seemed like they knew what was going on. 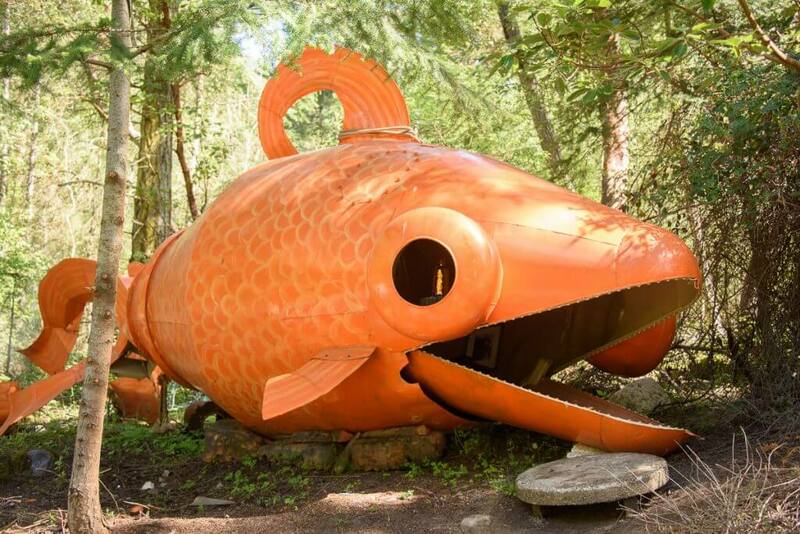 They informed me that local San Juan Island artist Kevin Roth repurposes trash and turns them into whimsical art pieces. Most importantly, he’s passionate about involving kids in art. My preschooler and I thoroughly enjoyed exploring the houses. They had heaters inside and patrons had left notes and gifts inside. Additionally, there were also free books available. My son got a kick out of being able to go inside and explore. It’s really such a quirky thing to do in San Juan Island, WA. 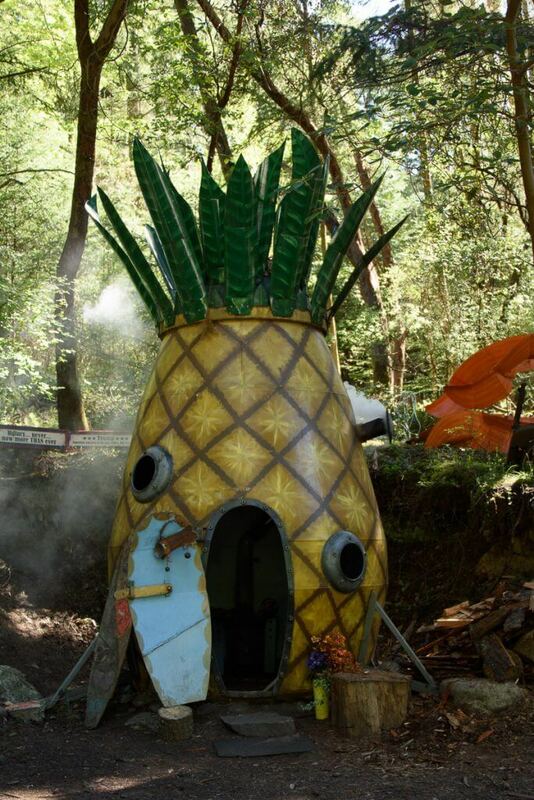 I’m drawn to anything pineapple, so Kevin Roth’s Pineapple Clubhouse is what first caught my eye as we drove down the road. There was a nod to Spongebob Squarepants inside. Mostly, it was just a special place to spend a few moments with my son exploring art. We still had a bit of time before our ferry home. We noticed Horshu Ranch on our map of San Juan Island. Amazingly, it was just a short drive away so we headed over. We were hoping to do a pony ride, however we learned that they were only offered on Saturday mornings or by appointment. That’s what we get for not calling ahead. There’s a shuttle people can take from the ferry if they come over just for the day. Thankfully, we still had a great experience at Horshu Ranch! 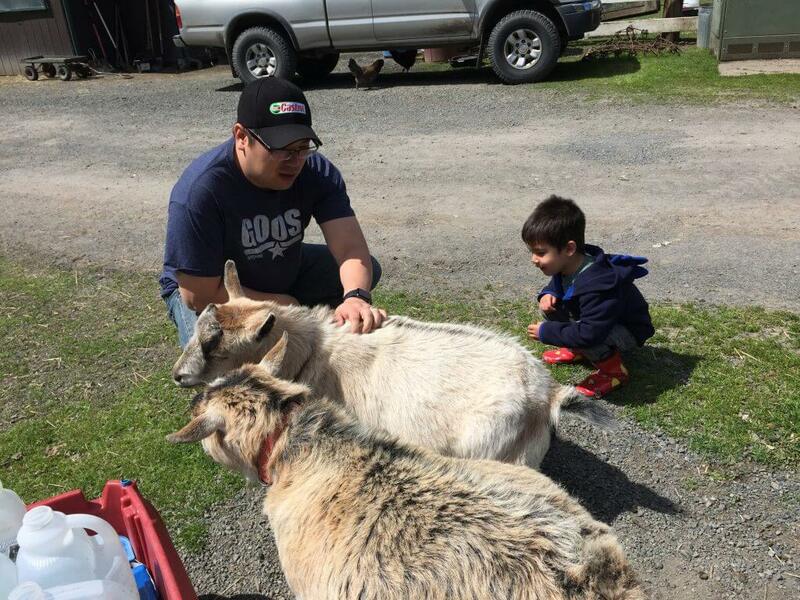 One of the staff members introduced us to Mango and Woody, two heavy-set goats. 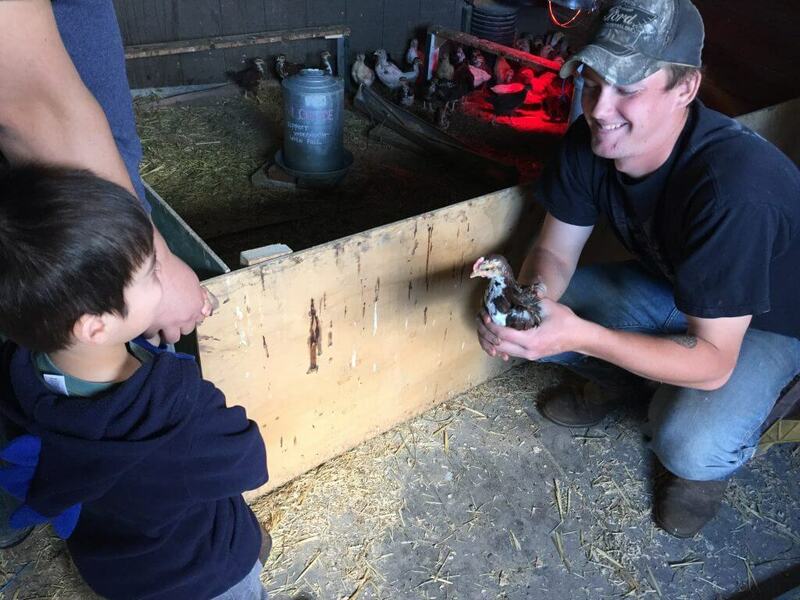 We also met baby ducks and chickens. We definitely will make it a stop on our next trip and schedule a horse ride through the woods. Our last stop on San Juan Island was the ferry terminal. We got there a bit early for our departure, so we were sent to Lot B. This was a few blocks from the terminal. This was actually a blessing because it gave us the opportunity to play at Sunken Park. Not only were there swings, but they had a small play structure with a telescope. I told my son to keep watch for the ferry! There was also a basketball court, lots of picnic tables a barbecue, and a drinking fountain. The small gazebo was a great place for some shade. This was a perfect place to get some wiggles out before the long trip home. We received a hosted and discounted stay at Earthbox Inn & Spa and 3 hosted tickets on San Juan Excursions. All opinions are my own. These pictures make me jealous!!! I have never been to Seattle and didn’t realize there was more to see outside of it. It appears to be the perfect weekend getaway for little ones and adults. Thanks for sharing. There are so many amazing places outside of Seattle. The San Juan Islands are a definite must-see! 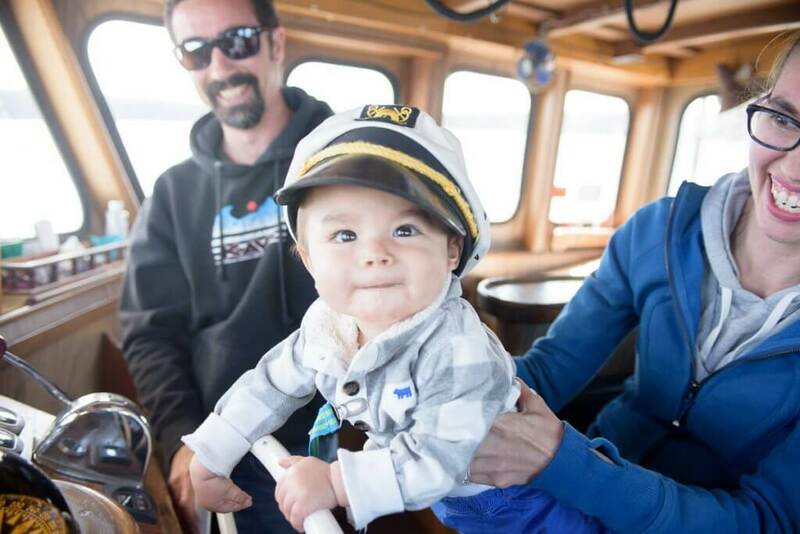 Love your baby sea captian photo! Also the chance to see humpbacks, amazing!! I hope to one day and I didn’t know you could in Washington! What an incredible playground for kids! It’s always great to visit a place where kids can roam, discover and explore! Exactly! Such a kid-friendly destination! The San Juan Islands look like a fun place to go for a getaway. How lucky to be so close. We spent a week on San Juan Island last summer and loved it. We camped, but the Earthbox Inn looks amazing! I think we might need to stay there next time we go. I wish we had stopped at the fruit houses. We saw them, but weren’t sure if we could go up to them. Another thing to put on the list for next summer! Yes! We only stopped at the fruit houses because we saw two ladies walking around there that looked like they had been there before. We figured we could ask them if it was okay to explore. Definitely a highlight! Oh your babies are so adorable! I love reading moms that actually take their kids out of the house to explore! It’s so good for them. It looks like you guys had a blast, so happy for you! What a beautiful trip! The pictures make me want to rush out and do the same thing. 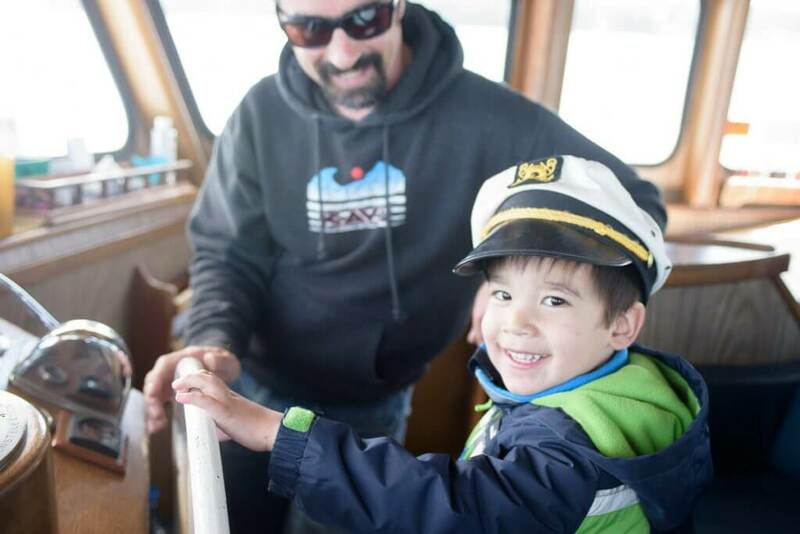 The baby certainly does make a great sea captain and your older little looks like he is simply having a blast! I know my 3 year old would love this whole trip. Three-year-olds have so much fun on adventures! It’s the perfect age because they are excited about almost anything and have the energy to explore! 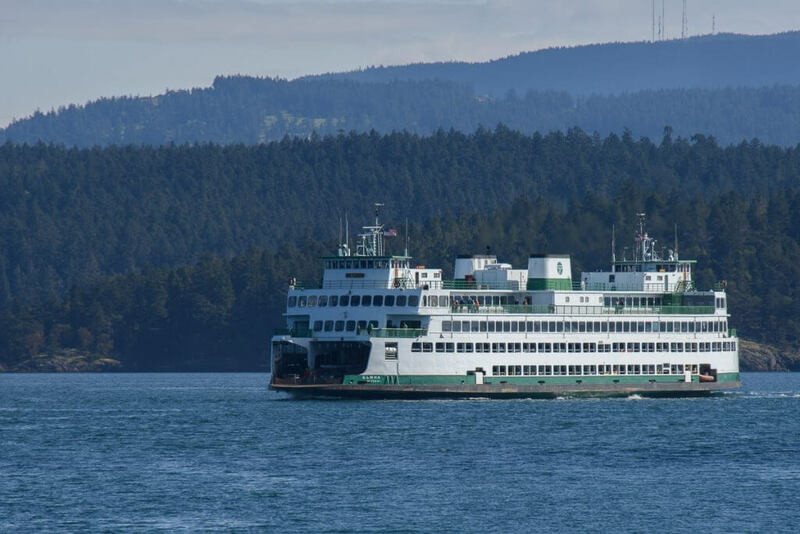 That looks like such a lovely trip – I have always wanted to visit San Juan Island. My husband has been interviewing with a company in Seattle, so perhaps we might have to sneak in a trip if he gets further along..
Ooh! If you do end up coming here, let’s connect! There are so many fun places to explore! This looks like an awesome trip with the kiddos! Whale watching is on my bucketlist. 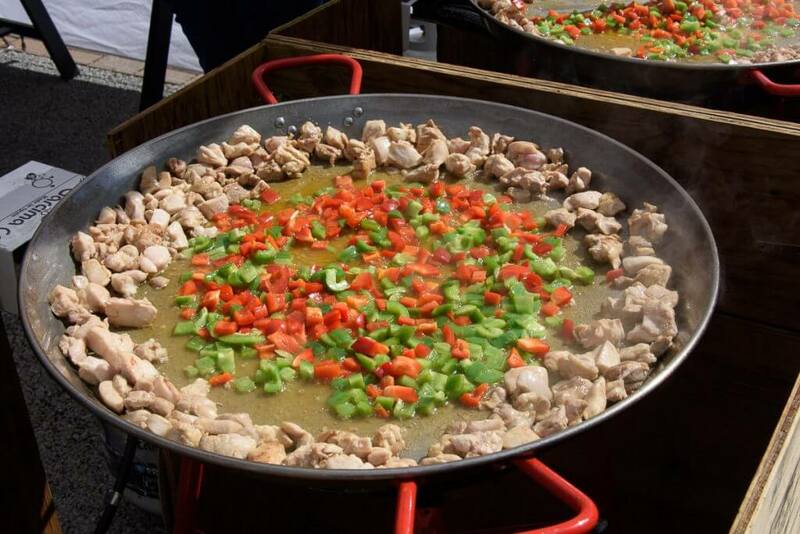 I would love to try whatever that is they are cooking at the food market, looks delicious! Sounds like you guys were having a wonderful trip! There are so many activities to do, will definitely put them on my bucket list especially whale watching! Whale watching was fabulous! San Juan Island is just a really lovely place to visit! It looks like y’all had a blast! I know my daughter especially would love anything that involves seeing whales! She loved when we took her to the aquarium a while back and is fascinated with the ocean. I love taking the kids places, it just makes it a whole new experience. Now that looked like so much fun!! I love those kind of trips. Your kids are just adorable and the oldest looks like he had a blast. I so want to see whales like that. Whale watching is so much fun! It’s a lot of waiting around, but it’s so thrilling when they make an appearance! What a great trip <3 We are just north of you in BC so this is an awesome idea fr our next travels across the boarder. Great photos! Looks like you guys had an amazing time! And great weather too! I’m from Vancouver bc so not too far from there! Your kids must have had a great time with the whale watching! Very memorable! We LOVE Vancouver!!! Definitely one of our favorite places to visit! What a great place for a family trip. And I completely agree with you about Seattle being a great place for a weekend trip. There’s so many great things to see, hike, and eat. I feel so lucky to live in Seattle, especially during this wave of sunny weather we’re having! This looks like the perfect adventure place for kids – so much fun that already pops out of your photos! It is great to see that the kids there have the chance to get directly in touch with animals – I think this is such an important experience for children to get in touch with our beautiful nature in such a playful and nice way. The humpback whales look impressive as well, must have been a great trip! I have 3 little kids and I think they would all have such a good time here! A vacation sounds like exactly what we need. I love weekend getaways. It makes travel so much easier, especially with a handsome young man like yours. Have always wanted to head out to Washington and love the sculpture garden. Looks so cool. He is quite the handsome young man! Thanks! Washington State is a lovely place to explore! Come visit! It looks like you had an amazing trip! Whale-watching is such a fantastic experience. I am always amazed by how incredible those creatures are. Me too! I hope to come back in September one year for even more whales! This looks like a great getaway. I have never been to Seattle myself, but I am sure it is a lot of fun! I hadn’t been whale watching for years so it was quite thrilling! And my 3yo was on “lookout” for hours! I love seeing how you can still vacation with kids! Looks like an amazing trip, love you pictures! Thanks! We love to explore with our kids! I’ve never heard of this place before, but it looks beautiful, and perfect for kids! They seem like a friendly bunch, too, which is always a bonus. That boat trip must’ve been so much fun; I’d love to do something like that someday. The photos were great, too. The San Juan Islands are located in the Northwest corner of Washington State right next to Canada. Absolutely gorgeous part of WA State! I had never heard of San Juan Island before but this does look like the perfect escape. 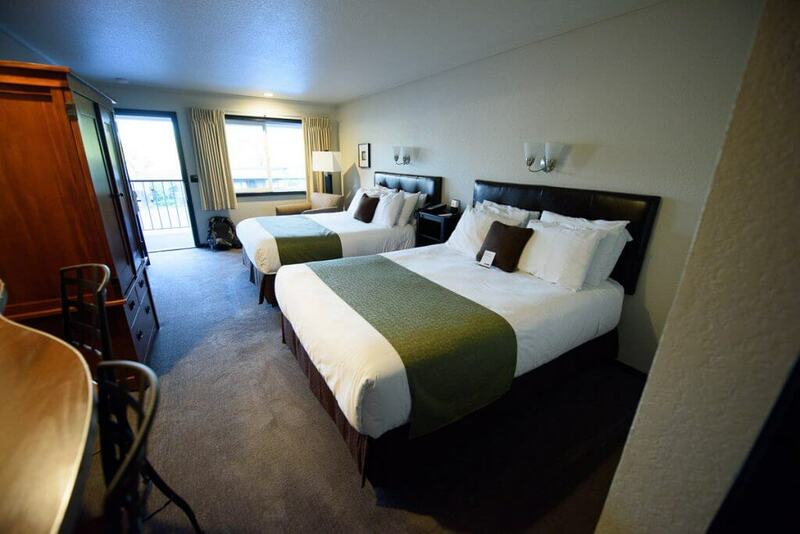 The place you chose to stay looks fabulous with a very spacious and comfortable room and amenities, not to mention the range of things to do there and the beautiful scenery. Your write up and photos are enough to make me want to go the next time I am in the Pacific Northwest. Yes, add a few days to explore the San Juan Islands! There are a lot of campgrounds on the islands that I’m sure you’d enjoy! Yes, they had a lot of fun! How sad is it that I have lived here in the PNW for my entire life ( currently the shadows of the Olympics) and have never ventured to the San Juans? Guess we all know where I am going this summer! I hadn’t visited until 8 years ago (and only because my husband’s family planned a trip there.) I didn’t realize what I was missing! I love the photos! So many fun activities to do! Lovely way to spend the weekend! Yes! Such a lovely weekend away! This trip looks absolutely awesome! I live in Florid and there is just nothing like this around here. It’s just a completely different environment and that’s awesome. Love this. Washington State has some gorgeous spots! What a fun little family trip. I’ve never been to San Juan Island but it looks like a great place to spend time with the family. It’s such a fun family destination! 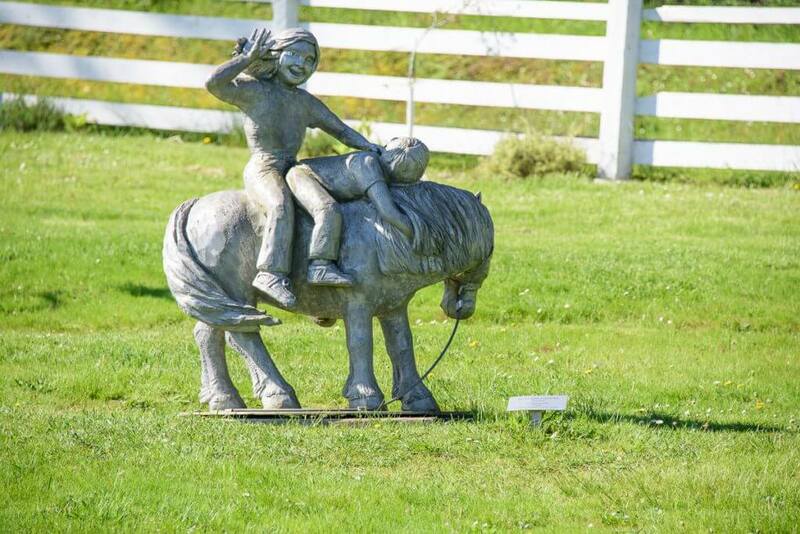 San Juan Islands Sculpture Park is so beautiful and looks interesting. Whale watching is beautiful experience which we cannot get everywhere. I was not knowing about San Juan is such a great place for family leisure. Will pin it. Thanks for the pin! Hope you can check out San Juan Island sometime! That looks like a fun trip! I love your whale tale photo. I didn’t realize how many things there was to do with kids! Thanks! Yes, tons of activities for the whole family! I had no idea there was so much to do. It all looks so fun! We could have spent a week here! It’s so true, my cousin lives in Seattle and goes around all the time! Never heard of San Juan Island and seems like a great little getaway! Hotel you chose is neat! So huge perfect for the whole family! What a great time you had there! If you come visit your cousin, plan to stay longer so you can check out San Juan Island! I could stay in that hotel room for 2 days and just sleep in, but that’s not possible with the kids! So, it’s awesome that you can take them to experience what it’s like to be in a boat and to navigate as well. Your little ship captain is adorable! And it looks like you all had a great time! Yes, if we didn’t have the kids, my husband and I would have spent a lot more time sleeping! But, this trip was surprisingly relaxing! This is a lovely place to get some peace and quiet while you spend time with the kids! I love that there are plenty of things to do here. From exploring the water to exploring everything there is to explore on land. It’s a lot of fun! 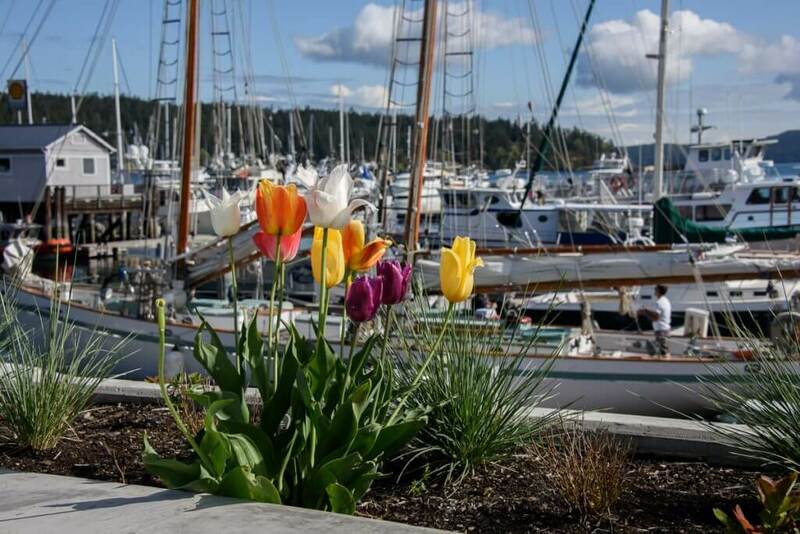 Yes, the San Juan Islands really have it all! Plus it’s just gorgeous and peaceful! That was an awesome weekend trip. So much to do, especially, for kids. Great post! Yes, it’s perfect for families! The hotel looks gorgeous. 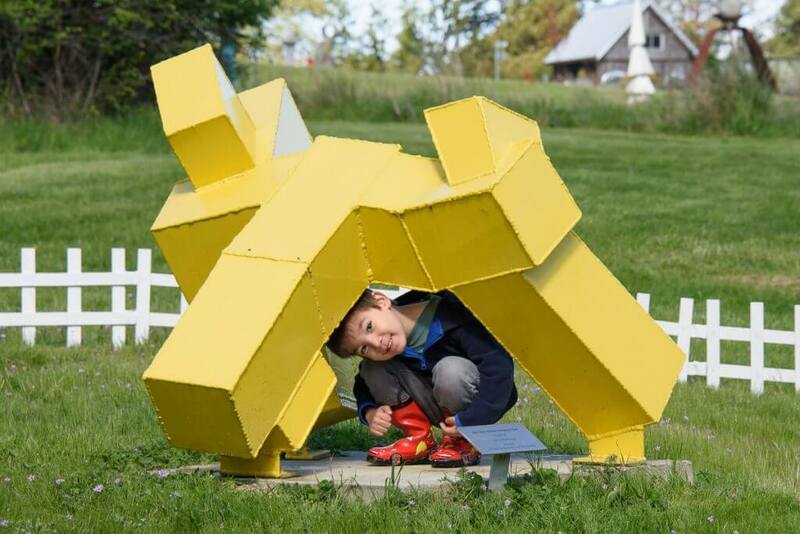 And San Juan Island is full of colour with lots of things to keep the children occupied. A great place for a family trip and the opportunity to get outside and enjoy time together with nature! Yes, I’m mostly an “indoor” person, so this was a great opportunity for me to explore nature with our family! It looks like such a fun vacation for the entire family. Your kids looked like they really enjoyed themselves. 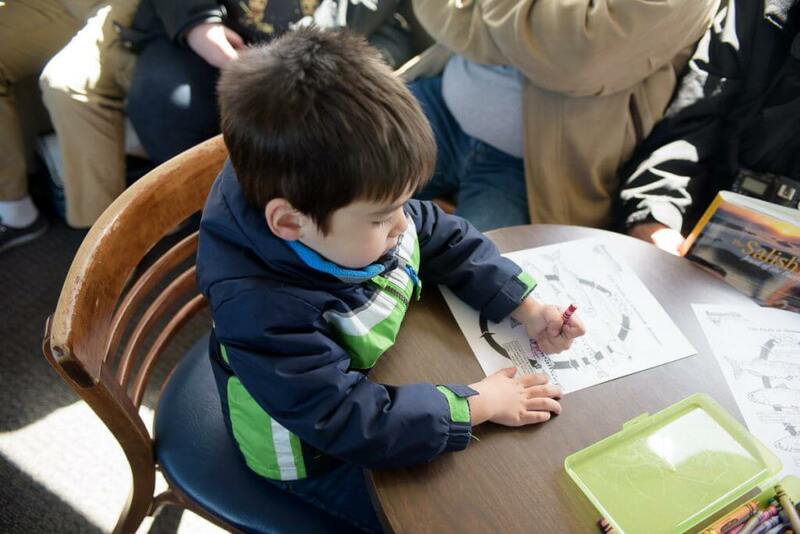 The whale watching tour is perfect to take the kids to! There are so many things to do in San Juan with kids. I know how hard it can be to keep them entertained and looks like your 3 year old had lots of fun. 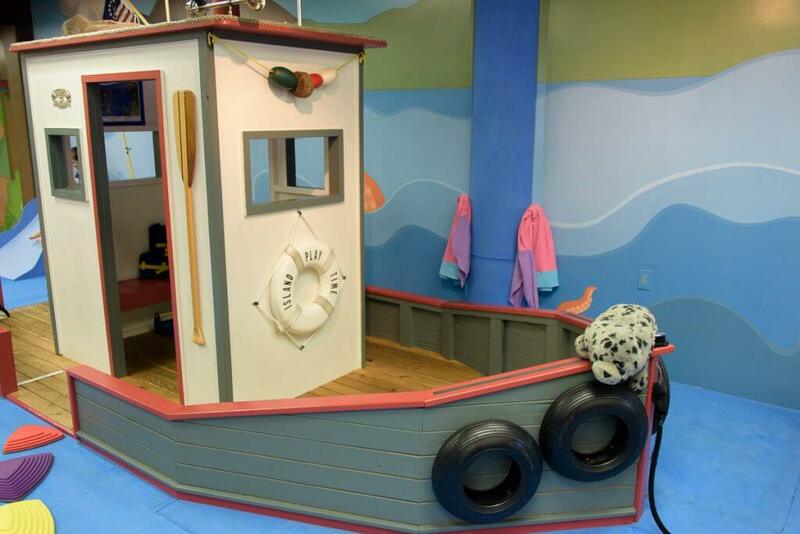 Whale watching sounds like so much fun and the indoor play area also looks great. A Place to Play was definitely a highlight! What a fun family adventure. I’ve never been to the San Juan Islands–the hotel looks perfect. The hotel was fantastic and in such a great location! 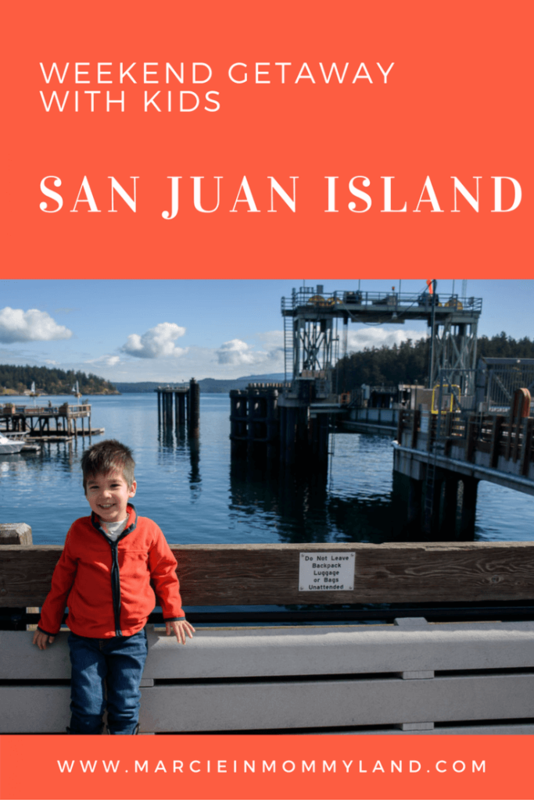 San Juan Island seems like a great place to visit with a family. The pics of the food look amazing and it sounds like you and your family had an amazing time. We can’t wait to go back! I’d also like to explore some of the other islands next time! That looks like an amazing time! I would love to go here someday and relax with the family. I have always thought that the Pacific Northwest was a beautiful place. What a great way to spend a weekend sounds like you had a blast on a trip with your kids enjoying and learning at the same time. Whale watching and exploring the Kevin Roth’s Roadside Attraction must be so much fun for the kids. And Earthbox Inn & Spa does look like a great place to stay too. It was all such a fun experience! I’m already plotting our next trip there! 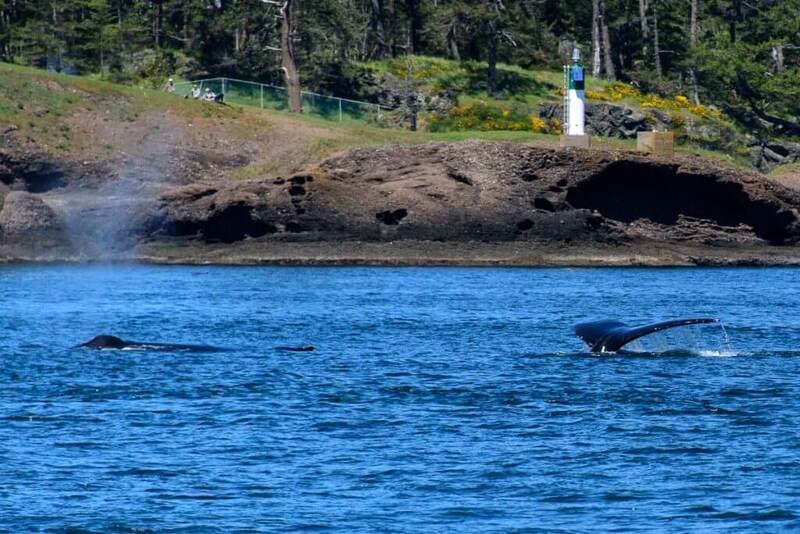 Looks like you guys had a great time at San Juan Island. Your kids are so precious! This seems as if it was an excellent family trip and it makes me want to visit and perhaps live in the Pacific Northwest even more now! How insanely cool to see humpback whales in their natural habitat?! I would LOVE to do that with my family. One the list for sure. Thank you for sharing. It was such a special moment! My 3yo still asks about humpback whales and wants to know more about them. I would love to do more traveling with my entire family. I’m not sure my one year old would do well with sleeping somewhere but home. Your kids are adorable. The little captain did a good job! = ) I like that the crew of the San Juan excursion let the kids experience a lot of things. The different works of art at the Sculpture Park are pretty cool. I would enjoy going there with my friends. It is nice that artists have this kind of place to showcase their creations. The PNW is absolutely stunning! Hope you make your way out here during your travels! 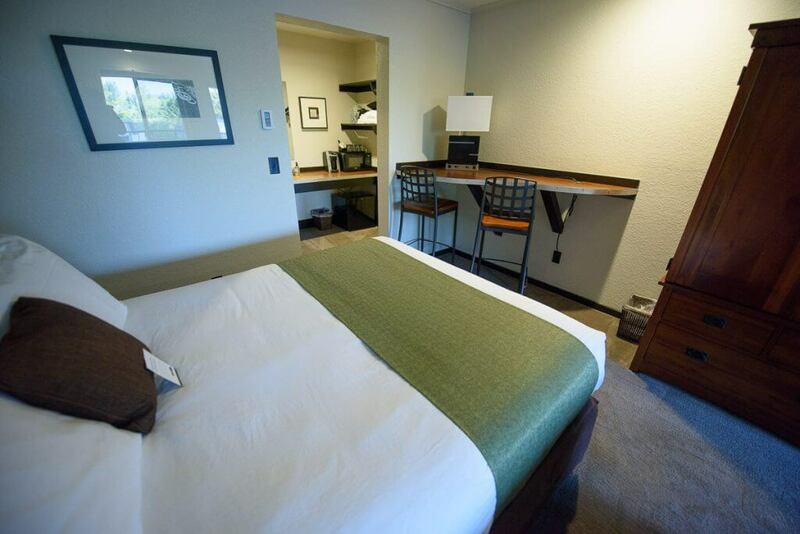 The Earthbox Inn & Spa looks perfect for a stay in the San Juan Islands with kids. In fact I’d choose this location if I was to go to San Juan with my daughter. That was good of the captain to invite the kids up, the picture of your 7 month old with the captains hat on is perfect! It’s good your son got to see a lighthouse, even though it was closed. Hopefully next time you visit it will be open. Traveling with kids is so much fun!! Ooooo it looks like y’all had one fabulous time!!! It’s so important for my family to find fun, family friendly places to go. Wow looks like such a really great time. Looks like lots to see and do with the kids, and would be a really fun family trip! This looks like such a fun and memorable adventure! I love traveling with my kids too… and exploring the world around us as a family! So glad you all had such a wonderful time. The hotel looks chic! True, carrying a crib for travels is indeed bulky and unless necessary its better to be avoided. I’ve done only Dolphin watching, so Whale watching sounds cool! Your little one looks so adorable with the Captain’s cap!!! The Earthbox Inn looks like a nice cosy play to stay at. Your boy looks like the proper captain of that ferry haha. Lime Kiln Point State Park scenery has driven me to a point of envy. It so calming and beautiful. What an amazing experience for you and your family! Such an enriching vacation! Thanks! We are so lucky to have so many fun areas in the PNW! This looks so fun! We may have to make a trip up!! Yes! It’s worth the drive! You are so lucky to live in such a beautiful place! I love the Pacific Northwest. I feel so incredibly lucky to live here! This looks like an amazing trip! I love all of the places you found to play! We always try to find quirky or interesting places to discover! It was quite spacious and clean! Looks like an amazing time. well this looks like an absolutely amazing little trip! i just love the ocean and the way it smells, and the way the wind feels on your face don’t you? !